The Axis P3343-VE has been discontinued. No direct replacement is available. The Axis P3343-VE Fixed Dome Network Camera offers superior image quality including day/night functionality and wide dynamic range, providing crisp and clear images of both illuminated and low-light areas. Remote zoom ensures that the viewing angle is optimized for the scene and required pixel resolution at installation. The remote focus function makes the installation convenient, eliminating the need for focusing at the camera position. Multiple H.264 streams, as well as Motion JPEG streams, can be provided simultaneously either in full frame rate or individually optimized for different quality needs and bandwidth constraints. 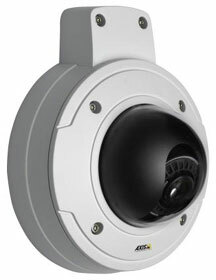 Axis P3343-VE with its weather-proof and vandal-resistant casing, is a fixed dome perfectly adapted for harsh environments. The camera operates in -40 C (-40 F) to +55 C (+131 F), powered by standard Power over Ethernet (IEEE 802.3af) only. It is the perfect solution for video surveillance systems in areas such as university campuses, railway stations and subways.